National University Honors admission Circular 2017-18 has been published. National University Honors admission Circular 2017-18 has been published. 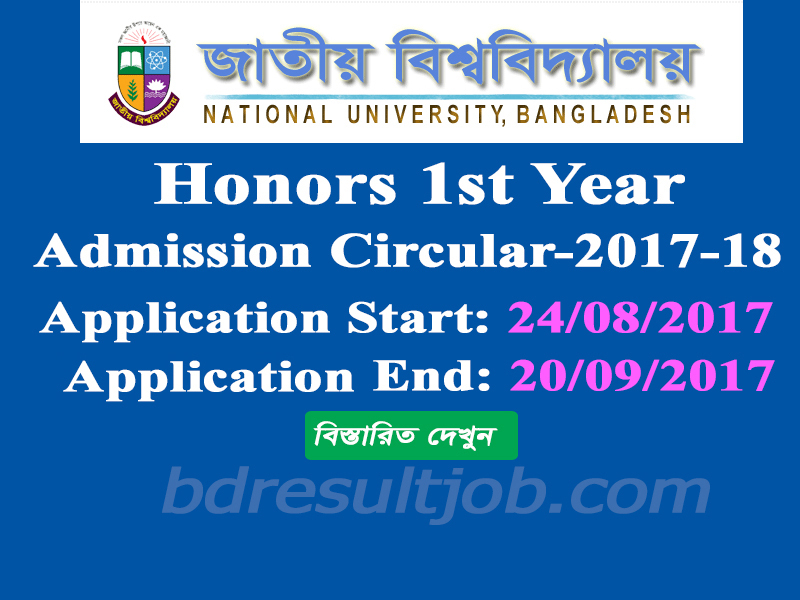 National University Honors admission Circular 2017-18 24th August 2017, 4.00 PM to 23st September 2017 and Last date of college submit: 24th September 2017. 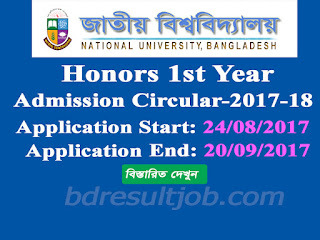 National University Honors admission Circular 2017-18 and Admission related all information will be found in National University Honors admission Official website at http://www.admissions.nu.edu.bd/ & our website www.bdresultjob.com as well. e. Minimum GPA 2.0 in HSC or Equivalent level. 1. Visit www.admission.nu.edu.bd or nu.edu.bd/admission and select Apply Now (Honors) option from Honors tab. 2. Now input your SSC roll, passing year and board and HSC roll, board and passing year. 3. Go to next step preview your information. Select your gender and check your birthday and correct it if need. 4. Go to next step and select your college by selecting division and district. Right side prepare your subject preference list according to you choice. You can make maximum 15 choice if there are department/subject available and you are Eligible. 5. Input your Mobile Number, E-mail ID(if any) and upload your color photograph in 150 x 120px within 50kb in JPG format. 6. Preview your application and submit it. 7. Print out our application and submit it on your college with required papers and application fee. Visit www.admission.nu.edu.bd and login your admission roll and PIN and request cancel. NU Authority will be send you a OTP (one time password) on your mobile number and input the OTP and finally submit it. Now your application will be cancelled. After cancelled the application form you can fill up again. a. Honors Application form with candidate signature. b. Mark Sheet/Tabulation sheet Photocopy of SSC and HSC or Equivalent. c. Registration card photocopy of SSC and HSC. 1st merit list will be published on NU admission Official website www.admissions.nu.edu.bd and SMS system. 1st Merit list after complete admission and then published 2nd merit list result also NU admission Official website Admission Result and SMS system. 2nd Merit list after complete admission and then published 3rd merit list result also NU admission Official website www.admissions.nu.edu.bd and SMS system. National univerisity merit list admission complete after will be published release slip notice. Student who are not 1st, 2nd, 3rd or cancelled your admission you are also eligible to apply for release slip. Every eligible student can apply NU admission webiste www.admissions.nu.edu.bd login honors option with their admission roll and PIN number. Release slip apply instruction below. a. http://www.admissions.nu.edu.bd/ or nu.edu.bd/admissions and select honors application login option from honors tab. b. login your student panel with your admission roll and PIN. d. Complete release slip application and submit it. e. There are no need to submit any papers to college or any fees for release slip application. Release slip application deadline after a date as soon as possible published release slip result. You can check your result by www.admissions.nu.edu.bd login with your admission roll and PIN. Tags: national university admission 2017-18. nu admission. admission nu edu bd. admissions nu edu bd. www admission nu edu bd. app1 nu edu bd. nu admission 2017-18. nu admission result 2017-18. Nu edu bd admission. national university admission 2017-2018. www nu edu bd/admission. nu admission result. nu edu bd/admissions. www admission nu edu bd com. nu result 2017-18. www nu edu bd/admissions. nu edu bd/admission. nu 3rd merit list 2017-18. www nu edu admission. national university admission result 2017-18. Bangladesh Education and Job Portal: National University Honors admission Circular 2017-18 has been published.